In their latest attempt to smear the Occupy Wall Street (OWS) movement, Rupert Murdoch’s New York Post and other pseudo-conservative news outlets have exploited a minor dispute between the group’s finance committee and a few disgruntled protesters. AFP recently discussed the matter with one of the key spokesmen for OWS, who said Wall Street and Big Business are trying to undermine them by exaggerating what most activists consider to be a minor issue. 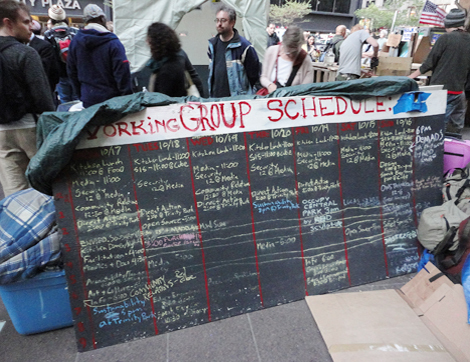 Some representatives of OWS’s 30 working groups have complained they have not yet received their share of the nearly $500,000 in donations that have been collected since the occupation began in September. Although this hardly qualifies as a major scandal, some OWS critics are portraying it as such, even going so far as to suggest that protesters in New York were becoming as greedy and power hungry as the Wall Street fat cats they claim to be fighting. This AFP writer spoke with Justin Lecea, an OWS information liaison in New York City, who was asked if there was any substance to the mainstream media hype. Lecea said those complaining are among a small minority of the protesters, and are in no way representative of the more than 40,000 activists who’ve made their presence known in lower Manhattan. While there are some disagreements as to how money is distributed, those matters are ultimately resolved during meetings of the group’s general assembly (GA). Lecea says the GA is an open forum anyone can attend. There is no central leadership, and all are permitted to submit requests for reimbursements or payouts, as well as vote on approval of those requests. “It’s democratic and transparent,” added Lecea. According to Pete Dutro of the OWS finance committee, $66,000 of the approximately $480,000 they have on account has been spent on computers, credit card processing fees, food and medical supplies. Most of that money has come from donors who contribute an average of $50 paid directly to volunteers at Zuccotti Park—ground zero of the OWS protests—or through online payments. Keith Johnson is an independent journalist and the editor of “Revolt of the Plebs,” an alternative news website that can be found at www.revoltoftheplebs.com.